I guess I better get this out before the new year. 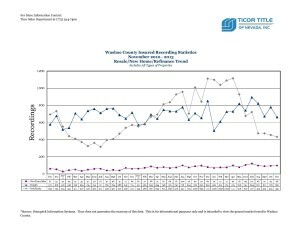 Thanks to Erin Schiller at Ticor Title for providing the updated foreclosure stats. The full report can be viewed by clicking the picture to the right. Below is the snippet…. NODs (start of foreclosure) went up by 7 but nothing to get excited about. Notice of Sale (property going to courthouse auction) went up 3. Same as above. Trustees Deeds (foreclosure sale at courthouse) went down by 30. No real movement here. New REO listings went up 1. Overall, a ho hum month in the world of foreclosures. If you would like more information on foreclosure or short sales contact Ricky Beach at (775) 393-9601 or Ricky@RickyBeach.com. We utilize a full time short sale negotiator in the hopes of making short sales run smoother. Posted in For Buyers, For Sellers, Market Update and tagged fha short sale reno, reno foreclosures, reno short sale agents, reno short sale negotiating, when will there be more foreclosures in reno.